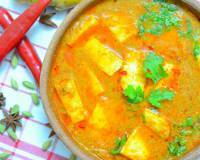 Tamatar Chaman is a delicious Kashmiri style paneer cooked in a tangy tomato gravy. 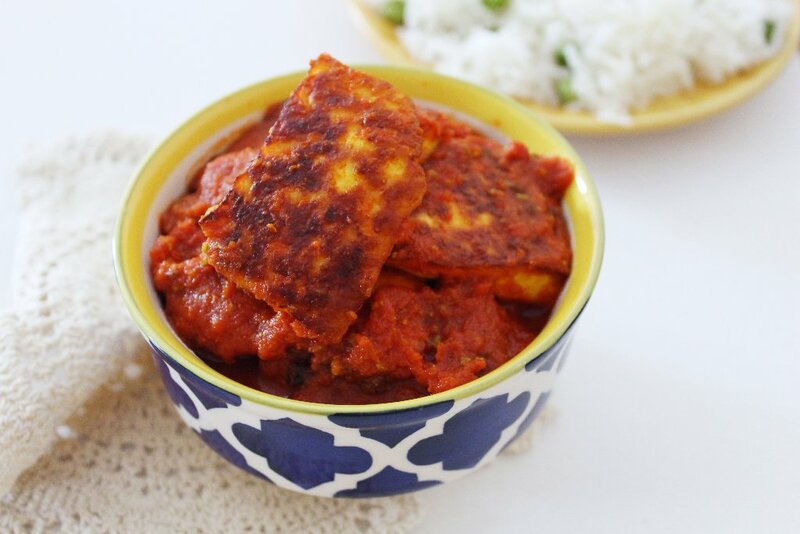 Here, paneer blocks are fried in mustard oil and then dunked in a tomato gravy flavoured with fennel seeds and dry ginger. 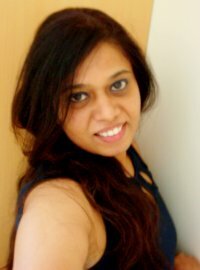 You can serve it along with dal, steamed rice and phulka for your everyday lunch. 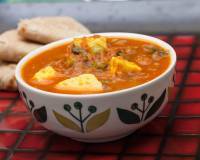 Tamatar Chaman is a delicious Kashmiri style paneer cooked in a tangy tomato gravy. 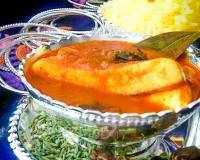 It is a popular dish from the Kashmiri Muslim cuisine, where the use of the onion or garlic is negligible. Here, paneer blocks are fried in mustard oil and then dunked in a tomato gravy flavoured with fennel seeds and dry ginger. Both the fennel and dry ginger adds a distinctive flavour to the dish. It is prepared using very few ingredients, however the dish is delicious to be had with steamed rice. Serve the Kashmiri Style Tamatar Chaman Recipe along with Steamed Rice and Haak T Thool for a simplified Kashmiri Cuisine inspired weeknight dinner. 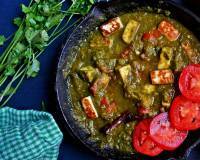 To begin making Kashmiri Style Tamatar Chaman Recipe, heat mustard oil in a heavy bottomed pan till it reaches the smoking level, place the paneer cubes and fry until it turns golden. Flip over and brown the other side as well. 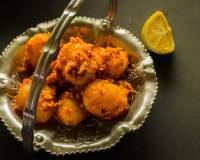 Once the paneer cubes are nicely fried, immerse them in a bowl of 1 cup warm water mixed with turmeric powder. This will keep the paneer soft. In the same pan, add the cumin seeds and let it splutter. Add the chopped tomatoes and cook until it turns soft and mushy. Mash the tomatoes with the back of the laddle, until they turn nice and pulpy. Add the fennel, dry ginger, kashmiri red chilli powder and mix well. 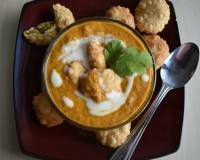 Add in the fried paneer along with the turmeric water and bring it to a brisk boil. Add the kashmiri garam masala, season with salt and let the gravy simmer for 15 minutes, till it all comes together and the oil separates out. 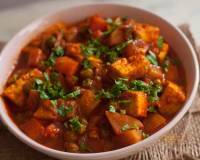 Switch off the heat, add in the shahi jeera to the Kashmiri Style Tamatar Chaman, mix well and let it rest for 10 minutes before serving so that the spices get infused into the paneer.